Since September, the AfD Alternative für Deutschland (Alternative for Germany) has been represented in the Bundestag with its 92 delegates and is staging a butting of heads with the established parties, generating a lot of media attention. But what drives the party behind the scenes - and is xenophobia the basic stance everyone shares? No one can better furnish information than Franziska Schreiber, who sat on the board of the “Junge Alternativen” (Young Alternatives), the youth organization of the AfD, in 2017. 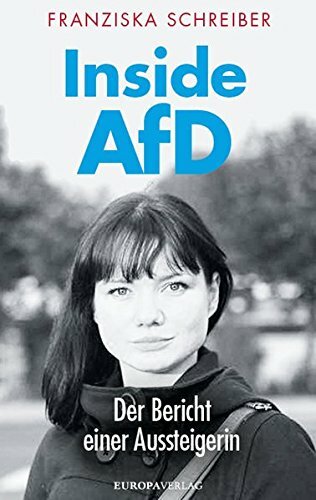 In her book, she speaks openly about the drive, goals and weaknesses of the AfD leadership under Alexander Gauland and its radical hounders such as like Björn Höcke. When the now 27-year-old joined the AFD in 2013, her career took off. Within a year, she becomes the chairwoman of the Young Alternatives in Saxony. In 2017 she makes it to the federal executive board. At Frauke Petri’s side, she takes a firm stand against the increasingly radical wing surrounding Björn Höcke. Appalled at the statements that are now normal and accepted within the AfD, she and other liberal members undertake a final attempt to change their course at the Federal Party Convention in Cologne in March of 2017. But the attempt fails. It’s time to distance herself. She publicly resigns from the party just one week before the 2017 general election and assumes the responsibility of informing voters about the party’s shift to the right. In her book she tells the entire story of the AfD and makes it very clear why the party and its leaders are more dangerous today than ever before.